We make roll-offs that work as hard as you do. We believe in hard work. In building things. In the doers that make America great. Those that rise early and often and do not take a day off. We believe in those that invest in their company by burning the midnight oil. You don’t cut corners and neither do we. Bucks® American made roll-off containers are designed to work as hard as you do, day in and day out. They will not waste a day or a dollar. “Made in America” is more than where we manufacture our products. It is a deep-rooted commitment to providing American jobs that support families, high-quality American products, and exceptional American service. 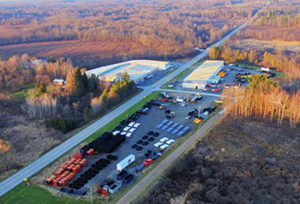 Conveniently located near the intersection of I-79 and I-80, in the “heart of steel country”, our 60,000 square foot plant lives and breathes to produce the best containers in the industry. With an assembly line style, our shop houses the latest industrial design and fabrication processes for greater precision and efficiency so that every job is done right—every time. Our roll-off containers are 100% American made, using only North American certified steel and hand finished with Jamestown Coating Technologies Solvent-based air dry enamel – making Bucks® the strongest boxes on the East coast, as well as the best investment and value in the industry. Since 1984, we continually work to improve our processes to better serve you, our customers. Our ASME certified welders, many with over 30 years of experience, work hard and work smart with your best interest in mind—every time. We utilize LEAN manufacturing principles to ensure that we are efficient and focused on customer and employee value in every decision. There is NO substitute for our dedicated, experienced, hard-working individuals that are committed to making the highest quality, American made roll-off containers—every day.